Hereditary pancreatitis (HP) is an inflammation of the pancreas, attributed to genetic causes. It was first described in 1952 by Comfort and Steinberg but it was not until 1996 that Whitcomb et al isolated the first responsible mutation in the trypsinogen gene (PRSS1) on the long arm of chromosome seven (7q35). The term "hereditary pancreatitis" is used when a genetic biomarker is identified, and "familial pancreatitis" otherwise. HP is characterised by attacks of epigastric pain, which are often associated with nausea and vomiting. Symptoms may start shortly after birth but onset varies periodically, with some patients not exhibiting symptoms until adulthood. There is usually progression to chronic pancreatitis with endocrine and exocrine failure and a mortally increased risk of pancreatic cancer. Lifetime risk of cancer has been variously calculated as 35–54% to the age of 75 years and screening for early pancreatic cancer is being offered to HP sufferers on a scientific basis. Some patients may choose to have their pancreas surgically removed to prevent pancreatic cancer from developing in the future. The epidemiology of HP follows a similar pattern to alcohol-associated chronic pancreatitis, but there are important differences. For example, HP typically has an earlier age of pancreatitis onset; although malabsorption and diabetes mellitus occur at a later stage in the disease progression. The vast majority of the cases of HP are caused by substitutions, at base 365 (c.365G>A) and base 86 of the cDNA (c.86A>T) on the PRSS1 gene. The nucleotide substitutions were discovered in the late 1990s by classical linkage analysis and are now known as p.R122H and p.N29I respectively, according to the amino acid substitution and position in the protein sequence. These mutations are rarely identified in general screens of patients with idiopathic disease and the phenotype of p.R122H and p.N29I is now well characterised with the p.A16V mutation recently characterised for the first time. 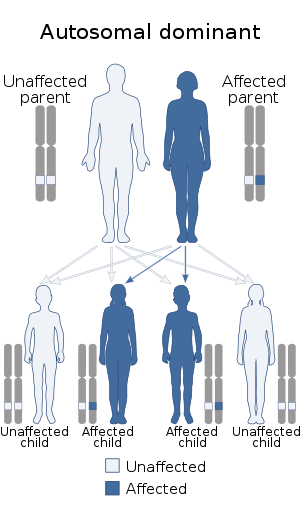 There are many other rare mutations or polymorphisms of PRSS1 which remain less well understood and not all HP families have had the responsible genetic mutation identified. The mechanism by which these genetic mutations cause pancreatitis is not yet known; but is likely to be the result of increased autoactivation or reduced deactivation of trypsinogen. However, a novel mechanism has recently been identified in a p.R116C kindred. Families are defined as having HP, if the phenotype is consistent with highly penetrant autosomal dominant inheritance. In simple terms, this would require two or more first degree relatives (or three or more second degree relatives) to have unexplained recurrent-acute or chronic pancreatitis in two or more generations. It is an autosomal dominant disease with penetrance that is generally accepted to be ≈80%. A 2009 study which followed 189 patients found no excess mortality despite the increased risk of pancreatic cancer. ^ a b Comfort MW, Steinberg AG (May 1952). "Pedigree of a family with hereditary chronic relapsing pancreatitis". Gastroenterology. 21 (1): 54–63. PMID 14926813. ^ a b Whitcomb DC, Gorry MC, Preston RA, et al. (October 1996). "Hereditary pancreatitis is caused by a mutation in the cationic trypsinogen gene". Nat. Genet. 14 (2): 141–5. doi:10.1038/ng1096-141. PMID 8841182. ^ Cheifetz, Adam S.; Brown, Alphonso; Curry, Michael; Alan C. Moss (2011-03-10). Oxford American Handbook of Gastroenterology and Hepatology. Oxford University Press US. pp. 223–. ISBN 978-0-19-538318-8. Retrieved 9 August 2011. ^ a b Lowenfels AB, Maisonneuve P, DiMagno EP, et al. (March 1997). "Hereditary pancreatitis and the risk of pancreatic cancer. International Hereditary Pancreatitis Study Group". J. Natl. Cancer Inst. 89 (6): 442–6. doi:10.1093/jnci/89.6.442. PMID 9091646. ^ a b c d Howes N, Lerch MM, Greenhalf W, et al. (March 2004). "Clinical and genetic characteristics of hereditary pancreatitis in Europe". Clin. Gastroenterol. Hepatol. 2 (3): 252–61. doi:10.1016/S1542-3565(04)00013-8. PMID 15017610. ^ a b Rebours V, Boutron-Ruault MC, Schnee M, et al. (January 2008). "Risk of pancreatic adenocarcinoma in patients with hereditary pancreatitis: a national exhaustive series". Am. J. Gastroenterol. 103 (1): 111–9. doi:10.1111/j.1572-0241.2007.01597.x. PMID 18184119. ^ Greenhalf W, Grocock C, Harcus M, Neoptolemos J (2009). "Screening of high-risk families for pancreatic cancer". Pancreatology. 9 (3): 215–22. doi:10.1159/000210262. PMID 19349734. ^ Wolfgang, CL; Herman, JM; Laheru, DA; Klein, AP; Erdek, MA; Fishman, EK; Hruban, RH (Sep 2013). "Recent progress in pancreatic cancer". CA: A Cancer Journal for Clinicians. 63 (5): 322–323. doi:10.3322/caac.21190. PMC 3769458. PMID 23856911. ^ Gorry MC, Gabbaizedeh D, Furey W, et al. (October 1997). "Mutations in the cationic trypsinogen gene are associated with recurrent acute and chronic pancreatitis". Gastroenterology. 113 (4): 1063–8. doi:10.1053/gast.1997.v113.pm9322498. PMID 9322498. ^ Chen JM, Piepoli Bis A, Le Bodic L, et al. (March 2001). "Mutational screening of the cationic trypsinogen gene in a large cohort of subjects with idiopathic chronic pancreatitis". Clin. Genet. 59 (3): 189–93. doi:10.1034/j.1399-0004.2001.590308.x. PMID 11260229. ^ Lee KH, Yoon WJ, Ryu JK, Kim YT, Yoon YB, Kim CY (August 2004). "[Mutations of SPINK1 and PRSS1 gene in Korean patients with chronic pancreatitis]". Korean J Gastroenterol (in Korean). 44 (2): 93–8. PMID 15329520. ^ O'Reilly DA, Yang BM, Creighton JE, Demaine AG, Kingsnorth AN (2001). "Mutations of the cationic trypsinogen gene in hereditary and non-hereditary pancreatitis". Digestion. 64 (1): 54–60. doi:10.1159/000048839. PMID 11549837. ^ Witt H, Luck W, Becker M (July 1999). "A signal peptide cleavage site mutation in the cationic trypsinogen gene is strongly associated with chronic pancreatitis". Gastroenterology. 117 (1): 7–10. doi:10.1016/s0016-5085(99)70543-3. PMID 10381903. ^ Grocock CJ, Rebours V, Delhaye MN, et al. (March 2010). "The variable phenotype of the p.A16V mutation of cationic trypsinogen (PRSS1) in pancreatitis families". Gut. 59 (3): 357–63. doi:10.1136/gut.2009.186817. PMID 19951905. ^ Teich N, Rosendahl J, Tóth M, Mössner J, Sahin-Tóth M (August 2006). "Mutations of human cationic trypsinogen (PRSS1) and chronic pancreatitis". Hum. Mutat. 27 (8): 721–30. doi:10.1002/humu.20343. PMC 2793115. PMID 16791840. ^ Szmola R, Sahin-Tóth M (May 2010). "Uncertainties in the classification of human cationic trypsinogen (PRSS1) variants as hereditary pancreatitis-associated mutations". J. Med. Genet. 47 (5): 348–50. doi:10.1136/jmg.2009.072751. PMC 2930840. PMID 20452997. ^ Sahin-Tóth M (June 2006). "Biochemical models of hereditary pancreatitis". Endocrinol. Metab. Clin. North Am. 35 (2): 303–12, ix. doi:10.1016/j.ecl.2006.02.002. PMC 1602208. PMID 16632094. ^ Felderbauer P, Schnekenburger J, Lebert R, et al. (August 2008). "A novel A121T mutation in human cationic trypsinogen associated with hereditary pancreatitis: functional data indicating a loss-of-function mutation influencing the R122 trypsin cleavage site". J. Med. Genet. 45 (8): 507–12. doi:10.1136/jmg.2007.056481. PMID 18511571. ^ Kereszturi E, Szmola R, Kukor Z, et al. (April 2009). "Hereditary pancreatitis caused by mutation-induced misfolding of human cationic trypsinogen: a novel disease mechanism". Hum. Mutat. 30 (4): 575–82. doi:10.1002/humu.20853. PMC 2663013. PMID 19191323. ^ Whitcomb DC (September 1999). "Hereditary pancreatitis: new insights into acute and chronic pancreatitis". Gut. 45 (3): 317–22. doi:10.1136/gut.45.3.317. PMC 1727629. PMID 10446089. ^ Rebours, Vinciane; Boutron-Ruault, Marie-Christine; Jooste, Valérie; Bouvier, Anne-Marie; Hammel, Pascal; Ruszniewski, Philippe; Lévy, Philippe (2009-09-01). "Mortality rate and risk factors in patients with hereditary pancreatitis: uni- and multidimensional analyses". The American Journal of Gastroenterology. 104 (9): 2312–2317. doi:10.1038/ajg.2009.363. ISSN 1572-0241. PMID 19550412. This page was last edited on 13 February 2019, at 01:46 (UTC).